Sep - 04 | By: admin | 1 comment. Mentawai Adventure is among the very first companies based in the Mentawai Archipelago, operating a land based Surf Resort. Do we really need to tell you that the Mentawai Islands are one of the world’s most consistent surf destinations? If you surf, you already know that! 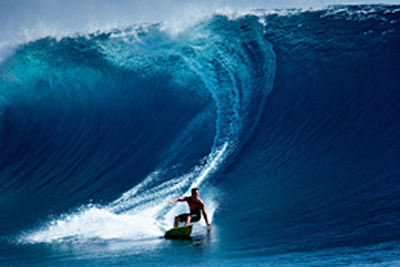 The Mentawai are directly exposed to the Indian Ocean “roaring forties” swell. From April to October, the dry season, surfers, from intermediate to advanced, will find in the Mentawai the best surf experience of their lives. Moreover, the potential for fishing, snorkelling and eco-tourism is quite remarkable. Mentawai Adventure organizes also a wide range of easy treks and activities in these off-the-beaten-track islands, allowing you some extras or your friend to enjoy a trek while you surf. Organized in close cooperation with certain Mentawai tribes, Mentawai Adventure offers you the opportunity to live on Siloinak, a quiet deserted island situated right in one of the best surf spots in the world. Mentawai Adventure offers a surf experience that you will never forget, thanks to the quality of our surf guides. All born in the area, they learned to surf with the first pioneers who dared venture there, 15 years ago. They know all the best spots, according to swell, tide and winds. With them, you will surf far from the crowds (and ‘crowds’ is anyway something of an overstatement…) in a radius of 15 miles from our resort; an area that includes 21 of the most consistent waves in the world, plus the “secret” ones never visited by charter boats… Our packages include all services, starting every Monday from Padang airport or hotel, ending every Wednesday at the same place. Packages include mainland and island transfers, surfing speedboat service, accommodation, food during your stay in our resort…and of course some of the best guides available to this day! A large uma, the traditional Mentawai long house, offers a spacious living area for eating and partying. Its 80 m2 dining room and lounge offers splendid views over the lagoon, and the ultimate luxury: beauty, space -lots of space- and comfort. The bungalows are spaced out in a large flower garden, so as to preserve guests’ privacy, and look out to the sea, 50 feet away. They accommodate 2 guests each. Single occupancy is possible, at an extra cost. Pillows, sheets and mosquito nets are of course provided, along with bathroom towels. spirit that prevails on the entire island. beach: classic sandwiches and salads, fruits and desserts, along withtea and coffee, and surf snacks.. Dinner is quite a serious affair with an “entrée”, main course, salads, cheese and dessert. Cold beer is available. 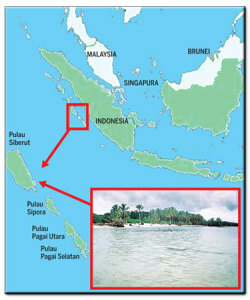 Due to its geographical situation Siloinak Island is totally protected from any possible tsunami coming from the Indian Ocean. 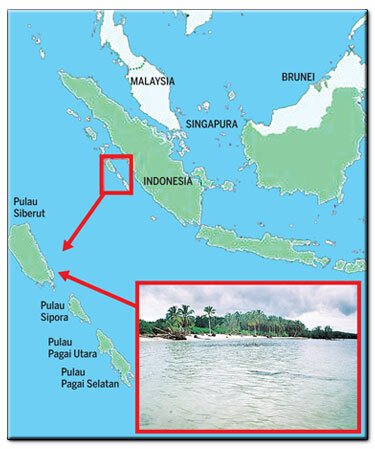 The waves would break on the islands of Nyang-Nyang and Siberut and would not reach Siloinak, which is known as the safest harbour in the area. Fishermen’s boats shelter there during storms. There are no objective dangers on Siloinak. No snakes and no mosquitoes or flies. In case a medical emergency should occur, our speedboats could reach Padang hospital in 6 hours, weather permitting.